She knew she had to have it. The building was condemned by the city of Paso Robles after barely surviving the 2003 earthquake, but artist Anne Laddon could see the potential in the structure and layout of the former auto parts and repair shop on Pine Street. When Laddon walked by the space years ago, it hit her, just like that. The building was clearly meant to be an art gallery. SUPER BLOOM Anne Laddon's oil painting, Carrizo Spring, captures the vivid colors of the wildflowers in bloom at the Carrizo Plains last year after the Central Coast received more than its normal share of rainfall. "We didn't have an art gallery in Paso," Laddon said. "For over 20 years I'd been grumbling about it." Nearly 10 years have gone by since Laddon's gallery, Studios on the Park, opened its doors to the public in 2009. To commemorate its history, the gallery will host Studios Roots: The Alumni Show, featuring just one piece from past and present resident artists, through April 29. Laddon relocated to the Central Coast in 1984 after meeting "a handsome cowboy" from Paso, her future husband, Jim, on a river trip at the Grand Canyon. Laddon showed her work in Arizona, New Mexico, and Colorado, but there was nowhere in town for artists to sell their wares. Laddon had been one of the founding artists at the Torpedo Factory in Alexandria, Virginia, so this wasn't her first rodeo. Shortly after they opened to the public in 2009, the studio held its first Paso ArtsFest, a free outdoor event that would run for the next seven years. "It was obvious to me when I looked at the building," Laddon said. "This is like a baby Torpedo Factory. I had already done it." So when Tom Peck, an artist who moved to Paso from Mill Valley to "enjoy life in the open, undisturbed country," saw a notice on the building at 1130 Pine St. about it becoming an art gallery, he quickly reached out to Laddon. He became one of Studios' first resident artists and juror of the Studios Roots show. With more than 50 artists displaying work in the show, Peck set a challenging standard for everyone to follow: just one piece per artist. PASSING THROUGH To get this shot, Self Portrait in Headlights, photographer Tom Peck parked his truck in the middle of the road with his then 7-year-old son sitting up top as the lookout, set up the shot, and had a photographer friend help with the execution. "Everybody has a tremendous body of work," Peck said. "To pick just one that represents you is an interesting task." For her piece, Laddon chose an oil painting, Carrizo Spring, that teems with vivid pinks, purples, yellows, and greens depicting the super bloom of wildflowers that sprouted up on the Carrizo Plains last year after a healthy season of rainfall. "I went out there seven times in two weeks," Laddon said. "It moved me. I'm a total color junkie." 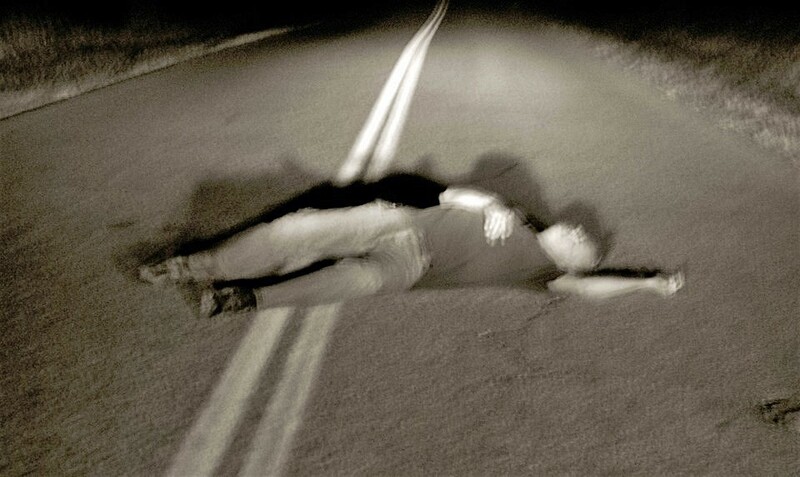 While Peck currently focuses on painting and sculpture, photography used to be his main medium, so for his piece he selected the blurry, surreal-looking black and white photo, Self Portrait in Headlights. In it Peck is lying in the middle of the road, almost as if he were dead. To get this shot Peck parked his truck in the middle of the road with his then 7-year-old son sitting up top as the lookout, turned on the headlights, set up the shot, and had a photographer friend help with the execution. Arts Editor Ryah Cooley's roots are in Paso Robles. Contact her at rcooley@newtimesslo.com.